Tendenci Operations, Search Engine Marketing and Online Advertising. The success of SXSW’s March event each year has brought a year-round calendar of mind-expanding events like the 2nd annual SXSW Eco conference a few weeks ago. SXSW Eco brings participants together to focus on areas of Sustainability. The popular SXSW format, panel discussions and meetings over the three days, allowed experts to share their ideas, successes and challenges with audience participants. I was able to attend a variety of sessions including one important to both Schipul and our clients who use technology to support their business or non-profit. Panel Summary: Many factors such as planned obsolescence, consumer trends, and updated technology contribute to e-waste becoming one of the largest societal waste segments. Exactly how recyclable are our electronics, and what are the most responsible methods of disposal? The panelists discussed the history of electronics recycling in Texas and the ways their organizations, alongside our state’s legislature, have gradually increased the ease of recycling for businesses. The panel shared the different local electronics recycling programs and explained which programs were legitimately using state approved certifications and processes so that Houston business owners could confidently select a certified recycling center. 15 years ago in Texas, most waste was being shipped overseas, and low grade metals were one of the main waste products. Within the last ten years, we’ve seen this change as more businesses are seeing the value of sustainability programs. Granted, some of this was instigated by policy change. 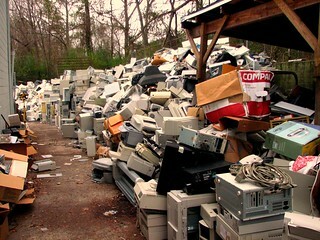 For example, Texas passed the 2008 Computer Take Back Law making computer manufacturers responsible for providing recycling to residents and small businesses. In 2011, there was only one certified center in Houston and now there are 5 certified centers indicating a move towards easier and more responsible waste management. The increase in facilities comes from businesses who provide recycling services moving towards end of life asset management for businesses, including refurbishing and re-use as much as possible, and encouraging recycling when re-use is not possible. Combined with policy changes, taking out the hazardous materials and doing the right thing has become a profitable business focus. Recyclers also recover more value when possible for the business or consumer than they did in the past. Yesterday’s technology included much more solid metals waste and was larger (think old Desktops). Today’s recycling stream allows removal of metals and proper disposal. Current electronics are smaller and more efficient in their production. This already eliminates some of the bulk of recycling. Both of these are results of policy changes bringing a change in practices and new business opportunities. Clive Hess, President of CompuCycle – Houston’s first R2 recycling center, brings success stories that share how CompuCycle has expanded their services to include data management and data sanitization, and provide better opportunities for Houston businesses to incorporate sustainability programs. At CompuCycle, many recyclers now securely erase, sanitize and provide warranties on products they resell. No products are sold as-is, but only with a warranty and if it can’t be sold with a warranty, then it is recycled. CompuCycle also participates in the unique recycling challenge called the WhatIf? campaign where you can donate your eWaste and they will hire and train individuals to recycle the components. This creates jobs and training for a local non-profit organization. The plan is to continue beyond the campaign as a sustainable endeavor, but they ‘need your junk’ to be successful. Most companies are not quite educated yet on R2 certification and the panel shed some light on how to evaluate and find the right certification options for your business. There’s still a long way to go for the recycling industry to be a recognized standards bearer and the EPA encourages companies to find out if the recycler you’re considering is certified by an accredited, independent certification auditor such as the ANSI-ASQ National Accreditation Board. The panelists agreed that Education will become key for Chief Sustainability Officers in companies and for your Chief recycler in your home. The people who fill these roles will want to seek updates and stay informed with both the changes within the recycling services corporate world as well as with Federal and State policy changes. Some rrecycling businesses are only registered and will include this as part of their marketing materials, but doesn’t mean they are certified for recycling responsibly. Our future should include policies that put pressure on electronic manufacturers to build upgradeable devices and longer life cycle products to reduce waste. But, this will require individuals to let their lawmakers know how to write these policies. Lawmakers listen to their constituency and particularly parents. Want to Help Improve E-Waste? Manufacturer’s need collection goals and the public needs easy locations to drop-off. Require retailers to provide information about recycling to consumers. Require state agencies to recycle assets via certified vendors. Recommendations that state computer Take Back laws include ALL electronics including TV’s and other waste. Find local R2 Certified Recycling facilities in your area. Concerned about the future of materials in your landfills near your children? Let your State Representative know your concerns. The EPA’s website also has a list of Recycling Resources where you can go to stay up to date on changes in policies and find tools to help individuals and businesses develop and implement sustainability programs at home and in your office. Silver Lining for Urban Mining – Urban mining and rare earth metals can be found locally instead of offshoring with other countries. Opportunities exist for job creation and has even been part of the lawmakers focus in Colorado for underserved markets. A de-manufacturing site provides jobs for disabled or underserved markets, and a refurbishing site can provide high-tech jobs for engineers. Recycling E-waste is a reverse supply chain position taking one part and producing many parts from the whole. The recycling industry is a consumer driven market. Imagine what happens if everyone started sending all electronics to recycling? It would be an influx of materials. A typical middle-income household has four or more devices per person in their home. Game consoles, cell phones, old iPods, CRT screens, printer, etc. Business is good for current recycling facilities. What happens when there is no longer a market for glass or other low grade materials? There are electronic parts that have value such as copper, gold and metals, but it is getting harder to handle materials such as glass, lead and plastic. Panelists were quick to suggest as invention increases, there is opportunity with the challenges. Glass is now used in aggregates for road construction to help the roads last longer with addition of silica to increase life span. Reground ABS plastics lower the cost of many manufactured items. There will be a greater need to find opportunities like these for our increased e-waste. Find a certified recycler near you, and find your representative. Have eWaste? Let us know and we can help you find the means to recycle responsibly! I am thankful for so many small things this year. Small acts, added together can make a much larger impact over the individual contributions. Being reminded of this, has allowed me to understand the random and planned acts of kindness, charity, faith, forgiveness and brilliance can change someone’s life. Sometimes it even changes a lot of lives. An Artist’s Body of Work is made up a collection of pieces developed over time and often in a series of repetitive themes. I had a great Architecture professor, fellow professor, friend and fishing buddy that was also an artist. We lost Richard Ferrier to cancer way too early in his life. At his memorial, countless students, friends and colleagues commented on the special moment or gift that Richard (RB) left with them. There were stories of a kind act at one of the Universities we taught at, a personal reference to some needed help, or even an encouraging pep talk. He provided behind the scenes help and encouragement to several generations of artists and Architects. As I heard one story after the other, it was clear that no one person really knew ALL the good deeds RB had provided. Driving home from that weekend, the stories began to overlap and the theme was clear. There was a recurring study in kindness that characterized his true ‘Body of Work.â€ Sure, there was a legacy of paintings, awards and even archives in the Library of Congress to preserve his artistic work. But, small uncelebrated acts of humanity and friendship were the real collection. He had influenced and changed more people than we ever expected. Richards work was changing people’s lives. I am thankful the ability to appreciate good design, to spell Winsor Newton watercolour with a â€˜u’, to catch a trout in the cold tailwaters of New Mexico, to see someone fly in a WWII fighter plane. I am thankful for the lesson – To change the world, all it takes is small acts in recurring themes. Slowly creating my Body of Work. The holidays just did a sideways skid into my life and it could easily become overwhelming. Really? It is December? Instead, I find it easiest and the most fun to fall back on three words brought into my life this year. Simple. Living. Technology. These words aren’t new or unique, but when I was able to combine them, my life began to hum. For your holidays and Friday Fun, let’s take a couple for a spin. Holiday Shopping can be an awesome excuse to buy for yourself or friends and loved ones. If you can’t find the greatest gizmo or gadget this year, then click on over to Lehman’s for some classic toys for kids (and you can send me a Sock Monkey or twelve if you must!). You won’t need batteries for this list, there are some classic games and hand made toys. Lehman’s is really best known for their Simple Living products. Their natural goods and old style tools help remind of what life was like before microwaves. Yep … there was life before microwaves, I am sure it was sweaty hard work, with little in the way of leftovers, and not nearly romantic, but it was there. Not ready to go that retro yet, but it is fun to see some of the nostalgic products. Living well doesn’t necessarily mean better than your neighbor. This year has brought a wealth of good things to our Houston lives for better living and sharing. One of my favorite ways to live well in Houston is with good food. You can experience locally grown food at one of the many Urban Harvest Farmer’s Markets, including the Sunday edition at Discovery Green. If you live under a rock, or haven’t ventured out to one of the many markets, you are missing out. Put something good in your body, buy locally and live well! This weekend also marks a recurring event in the Heights. Go visit the 1st Saturday Arts Market for ideas and unique gifts. Get it, 1st Saturday? You can probably figure out when these are going to happen. But, for sure this weekend you can visit from 11am – 6pm and fill a bag full of goodies. Farmer’s Markets and stuffed toys not for you? No worries, we can always fall back on Technology to help with the Holidays. Deal sites and social media accounts help navigate the overwhelmingness of Holidays. There is a brand new crop of coupon sites offering discounts and memberships. Between @Grouponhouston and Houston on the Cheap, you can stay local see what deals are the latest and greatest. Love food much? Houston Entree from My Table offers foodie deals to help keep up your strength during the holidays. Need more deals? Don’t forget your old school Woot for consistently good deals and laughs along the way. Holidays are a great time of the year, just remember to keep it Simple as you head into the first full weekend of December. I am a small town girl, who grew up in small town Texas. Really. CNN said it was the smallest typical small town in America for the Millennium 2000. It was a great place to grow up safely where the rest of the world didn’t set the pace. My mom chose it so she could care for my father in his later years of aging health care and not worry about their little girl when she couldn’t keep an eye on her every minute. It worked, I have some great memories even if I grew up rather quickly. But, it didn’t do much for my world view and experiences. One of the greatest gifts of my Mom gave me was the encouragement to learn about other cultures and travel when possible. So much so, that it required faith and living out her dream. 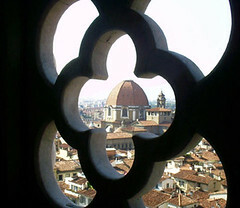 On the eve of a summer study abroad for Architecture in Italy, she was hospitalized for a heart attack. A phone call from my sister while I was packing interrupted the hundreds of little decisions about what to pack in only a backpack and carryon for 10 weeks. A long night, and several conversations later, and I was on a plane at her pleading. Mom never traveled across an ocean, but dreamed of it for her daughter. In all that was going on, she told me “Go! Learn about the world and have a better life that I dreamed of for you! Live out my dream for me.” It’s hard to argue with a 115 pound (when soaking wet), wiry, Texas born and bred Mom. And, her cardiologist promised to take good care of her. What I learned on that first trip abroad was to experience everything different than in my world, appreciate the differences and similarities. I came back inspired by history, art, architecture, culture and the people that make all these things so vital. Umm… good red wine and cheese as well, but that is another post. I learned with historical significance what we do in this world, in this lifetime, affects those who will come after us and builds on the body of work for our humanity. Could I have learned these things without traveling abroad, yes. Would I be the same person, no. My mom somehow knew this more than I did. She knew I needed to experience people and living differently. I know my place in this world is here in Texas, but I also know in small ways, I am connected to a larger picture and have so much more to learn from others. Mom did get released from the hospital and we shared great stories about my travels and many more trips and escapades. She lived vicariously until her heart couldn’t keep up with her spirit anymore. Her eyes shined with each story and photo and in retrospect, yes, Mom was right. Mom, Thank You for inspiring me to experience more about the world other than what is outside my living room window. Even when I had to leave your side under extreme circumstances, you inspired me to be a better neighbor to human culture. Hurricane Season supply checklist – be prepared! Hurricane Preparedness Kit from Schipul – The Web Marketing Co. on Vimeo. Water – at least 3 days of drinking water for everyone in your family including pets (about 1 gallon per person per day). Have a week on hand if possible. Backup sterilization devices (Steripen or Katadyn Extream) and water enhancers like powdered mixes that replenish electrolytes are handy to have as well. Food – at least 3 days of food per person and pet. We recommend foods that are easy to prepare and don’t require a lot of clean-up like peanut butter, Freeze dried/ dehydrated foods (available at camping stores0, and sweet treats and comfort foods. Don’t forget a can opener for shelf stable canned goods. Lighting– a standard flashlight with extra batteries is a good start. Since lighting is as much a need as a sense of comfort, fun lighting ideas include Glowsticks and Glow-In-the-Dark Stickers. First Aid Kit – extra allergy or prescription medication is a good idea. You may want to add old prescription glasses, sunscreen, and mosquito spray to your basic first-aid kit. Tools – a Mini crowbar or other multi-use tool , a fire extinguisher and backup fuel (for car, lawnmower or chainsaw) will suffice. Also protective gloves and back-up battery power for tools will come in handy. Communication – weather and battery operated radio, power inverter that plugs into you car, cell phone backup battery, and online wireless system (in case your phone is damaged), a wireless air card (for laptop) and a USB to back up documents and keep them safe. Atlas – It’s important to follow the secure hurricane routes recommended by officials. An atlas will help you navigate in case you need to go off the beaten path. Storage – keep everything in one safe place and don’t cheat and use it in the meantime. A nice backpack or storage bin is easy to grab and go and make sure items (like batteries or canned goods) are rotated out for freshness. How can we help you stay safe during hurricane season? Feel free to contact us (info@tendenci.com or 281-497-6567) for additional information or for help putting together your Hurricane Preparedness Kit. They fit in your pocket, on your key chain and just look cool. With all the phones and portable devices we carry these days, we forget about these flash drives at the bottom of our desk drawers. The USB drive still has a couple of great features for traveling. Even if you are settled in for a nice staycation, add this little packing and preparedness tip to your travel plans or todo list. Snag a USB drive on sale in a multi-pack as the prices continue to fall on these little jewels. Or, pick up one of Happy Katies favorite designer Flash drives by MimoBot. Now, get ready for some scanning. Files, documents and every important document you would ever need, all in your pocket. Scan personal documents and records in case you lose your wallet or passport and you will have a digital image of all your registrations. But, but… WAIT! What if the wrong person finds it when it drops out of the pocket of your shorts? No worries, you should encrypt the contents with TrueCrypt or your favorite security feature. These little tech toys have some crazy cool options besides just a backup. Don’t want to carry a laptop or computer with you? Can’t spring for the iPad yet? You can save all your bookmarks, favorite email settings, and doc settings on a FlashDrive and launch your profile from any public computer without fear of leaving your crumbs all over the desktop. Portable Apps is an open source software platform you install on your flashdrive or other backup device, adjust your settings, then plug it into a computer and run your programs from your own drive. You have access to all your software and personal data just like on your own PC. Vacation Plans: Itinerary, Maps and receipts of deposits for reservations. Personal documents: Drivers license, passport, birth certificate, Insurance cards (health and auto), Credit Cards and CC phone numbers for lost cards. Home Documents: Home Insurance, Auto Titles, Registrations, photos of big purchase items for insurance documentation, and documents that would be hard to replace if you came back home and they weren’t there. Yikes! My next plan is to scan old family photos for safekeeping before they detoriate or get wet in the next hurricane. Medical Records: List of medications for each family member, immunizations, List of family doctor and dentist contacts. School and Work Records: Nice to have everything in one place while you are at it. Include copies of your transcripts, diplomas, Resume, licenses, permits, Wills, and any other items you may want to keep all organized. Now, your life is basically in one place if you ever have to recreate your history or need to hide it Bourne style. This is a cheap and easy way to travel light, backup photos off the camera while on vacation for processing later, and use software programs securely when on public machines. In fact, buy a couple of the drives, make copies of the drive and give one to a friend to put in their safe deposit box or mail one to a family member in another part of the country in case of emergency. Enjoy your trip, be safe, and tell us how you use your Flash Drive for your vacation! Not sure when it happened, but I fell in love with lists. I am Thankful for lists. All kinds. Printable, written, embedded, moleskine, post-its, numbered, unordered, digital, iPhone apps. All. Fortunately, I work with tons of other people who share this passion and a few have contributed to my addiction. Before that, I used RememberTheMilk and ToDOist. Brandi‘ LOVES Twitter lists and I hope to make it on one of her lists someday. If I keep going, the whole office will want a list. Of their own. Most of my day is consumed with lists. Making them, marking things off, adding to the lists. I use GTD as a general practice. Thanks David Allen for your workflow process in addition to helping me to control my lists. Goodness knows, they could get out of hand and I would have lists of lists. 2009. Listened to Vint Cerf describe future of Internet, Thanks Schipul. The list can be random (like above), completions, trends, or things to do like Gwen Bell’s Life List. We all love shopping lists, packing lists and I even make checklists for emergencies. I love marking things off my list as much as making new lists. I can remember specific events and life decisions sometimes based on a pros and cons list. I am not sure they ever swayed a major decision, but they brought resolve and clarity to something that often drowned in possibilities. Thank you. I made a list of things I wanted in a life partner, things to take when I left town for a Hurricane, things to say when I wanted to thank my mom during on our last conversation and things to do this Saturday morning. If I don’t get everything done in a list, or the list changes? No worries. Sometimes it is just as fun to throw the list out the window and just go. I hope I never run out of lists of awesome things to do. write blog post about thankfulness of lists. Done. Tell me your favorite list tool, gadget or hack. Highlighting Safety Month, we wanted to focus on three things we love. Preparedness, Data and Stories. Author Ben Sherwood delivers on all in The Survivors Club! Ben Sherwood studied data from survivors of all kinds of events to find the commonality. Who survived and why? The range of things life throws at each of us includes everything from losing a job in a recession, being diagnosed with cancer, surviving a plane wreck or a even a burning building. The science of studying the people who survived catastrophic events revealed amazing similarities. Part 1 tells the extraordinary stories of survivors and their traits that gave them the advantage to overcome improbable odds. Their data helps unlock the mystery of survival and teaches you about the 5 personality types and twelve tools of survival. These stories were amazing in detail and inspiring in their hope and faith. Part 2 builds on the same traits, but focuses on you, the reader, and helps you determine your Survival IQ. Ben Sherwood, includes an internet based test to determine your survivor personality type. Don’t worryâ€¦ you can’t fail the test, but it helps you realize your strengths in an everyday situation or a major catastrophe. Ahemâ€¦ some people have been known to skip to the test first. Just sayin’. Oh yeah, if you don’t win, there is a shorter version online. We took the test and foundâ€¦ well, once you take the Survival Profile, you also get to read about other survivors of your same type and match your traits with theirs! Do you know which survivor you are most like? We hope you never need it, but we enjoyed reading how instincts, perspective and preparation can all make a difference in life threatening moments. In honor of this month’s Safety Month, we’re giving away a copy of this book AND an emergency supply kit to keep in your trunk to help you take your emergency preparation to the max! Join our Schipul Facebook fanpage and leave a comment here on this post about your favorite preparedness tip. What are you doing to keep your family, friends and business ready for anything? Do you have any survival stories you’d like to share? Leave your comments here and we’ll be selecting a random commenter (after double checking they’re a member of our Facebook fanpage of course’ it’s also Schipul Fan Mania month!!) on Friday, June 26th at 2pm CST.